Ok – so here’s the thing. I can cook but I am in no way a chef. I’d describe myself as distinctively average when it comes to culinary skills, but that doesn’t mean I don’t like to give it a go. I thought that once a month it would be nice (I could be wrong) to have a recipe on here for people to try, especially as we have some really really good chefs/bakers/cooks in the running club. What actually happened was that I ran out of time to bother people enough to do it for me. So I am going to start the recipe ball rolling and set the bar low by attempting to cook a Jamie Oliver recipe for chorizo carbonara with catalan market salad. 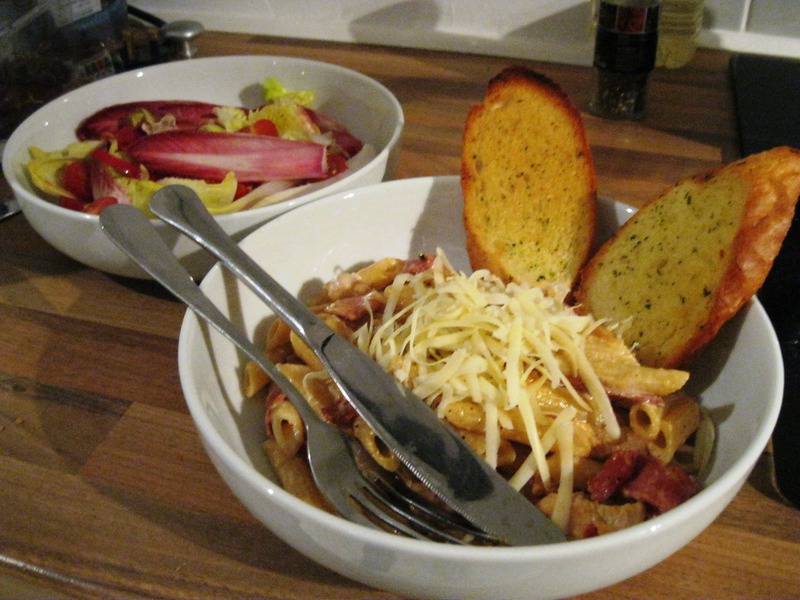 As this is marathon season and VLM 2015 is on Sunday, I thought there might be a few of you looking for a more exciting pasta recipe for Saturday night carb loading – so here it is! I am not going to outline the recipe as you can find it HERE, however I thought you might enjoy my review of the process. Anyone out there that fancies actually writing a recipe for next month please get in touch! Otherwise you’ll have to read something similar to this again! 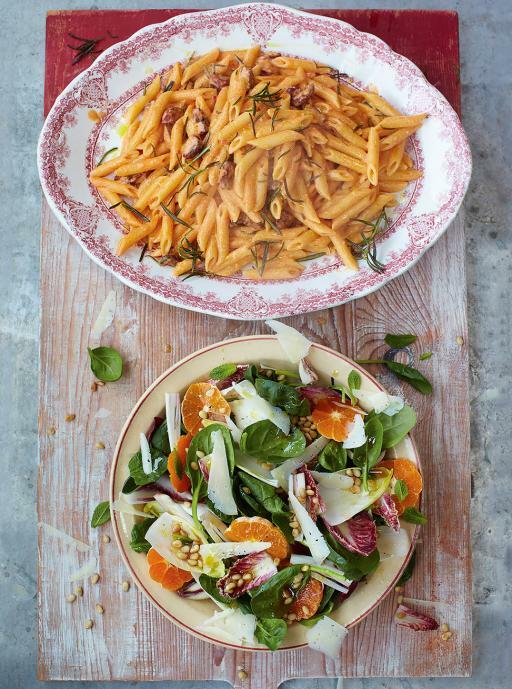 Chorizo carbonara with Catalan salad – This is how it should look. Ok, well I started by realising I had already defrosted turkey pieces the night before. So I was going to add those regardless and also the random bits of bacon that were left in the fridge from bacon sandwiches a really healthy breakfast a couple of days before. 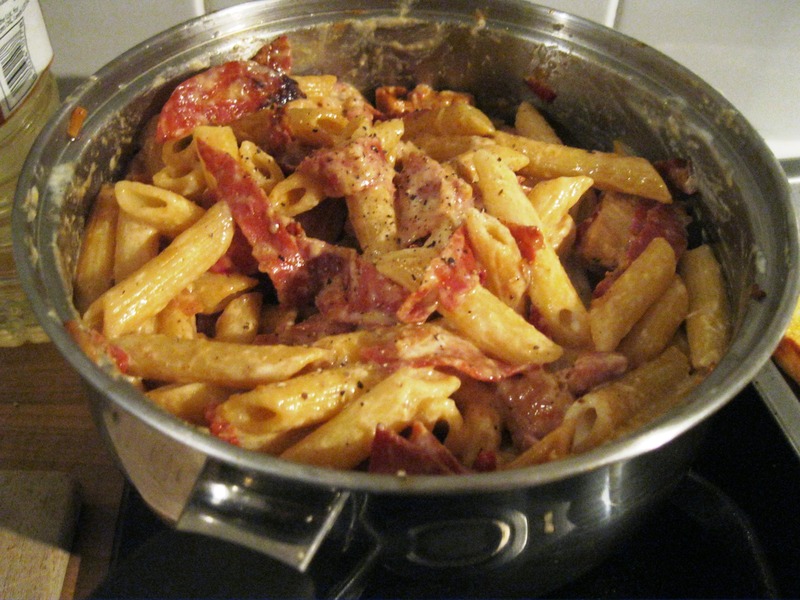 Already my recipe had developed into chorizo, turkey and bacon carbonara. Much better (everything is better with bacon). Moving onto the salad I didn’t have any spinach and hadn’t bothered to buy pine nuts. 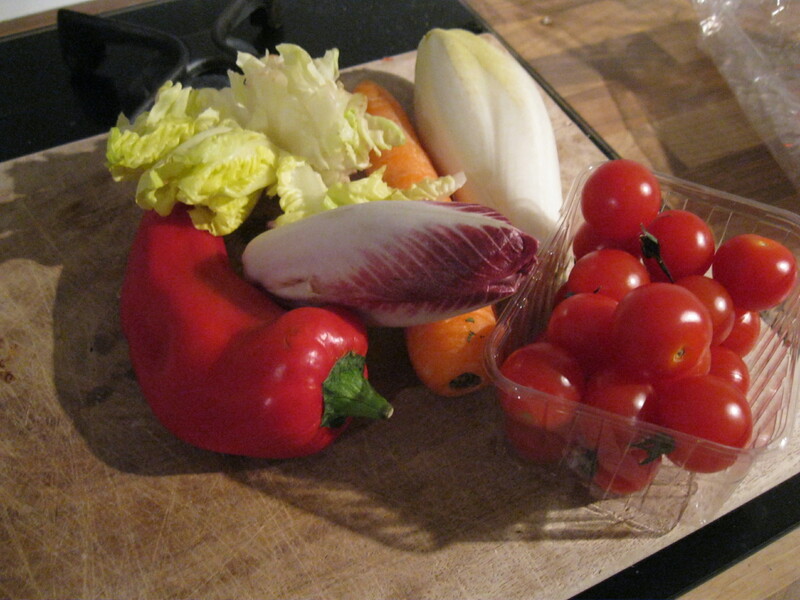 I had, however, made an effort to buy chicory, which is a stupid version of lettuce. I decided that putting clementine in a salad was a bit crazy. As no one I was cooking for had ever been to Catalonia, let alone a market there, I decided that my “catalan market salad” would include different ingredients. Namely those found in my fridge. The official photograph on the webpage looked good. I decided this was due to the wooden board that everything was placed on. So I replicated it with the salad ingredients. I felt like I was now on a roll – although I hadn’t sprinkled any pine nuts around the salad ingredients to make the photo look authentic. But with the photograph taken and the recipe adapted I was ready to go! 3. Cook all other ingredients except the yoghurt, egg and lemon juice. These go in another bowl. Mix everything together. But not the salad. Or it will be yucky. I spent some time being confused by the “Manchego cheese ” ingredient and then decided that it couldn’t be that different to cheddar. So I added cheddar. I then realised that I should have made a salad dressing. But feeling fed up with silly ingredients I decided it was fine as it was. My undressed salad also minus pointless pine nuts and not so pointless spinach. I don’t really own any rustic plates so white bowls would have to do and I decided to sprinkle cheese instead of rosemary over the carbonara (who wouldn’t). But the finished dish was actually ok. It was pretty quick to make and tasted edible. For a quick alternative to spag bowl that’s relatively healthy (maybe remove the cheese) this is a good option. I liked the yoghurt as a replacement for cream. 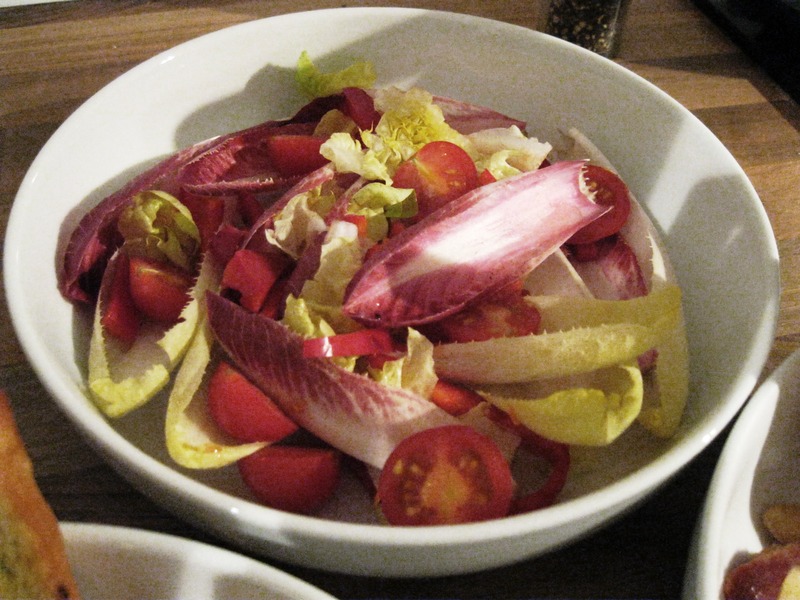 Chicory is overrated and whilst it looked pretty a little gem etc would have been nicer. I forgot to picture it on the wooden board so it obviously doesn’t look as good. That’s probably the only difference though. So here is my “Turkey, chorizo, bacon carbonara with Berkshire market salad”. Nailed it. Just missing the wooden board, pine nuts, spinach and oranges. Otherwise same. 1. Despite being motionless it is difficult to take appetising pictures of food (luck is improved with use of a wooden board). 2. Chicory is an expensive alternative to just about any other lettuce out there. 3. Lack of ingredients (or talent) shouldn’t deter you from trying. Good luck to everyone taking part this weekend in one way or another! Enjoy carbo loading! Want to get involved? We’re looking for other articles for the next few months, so if you have something you want to write about then get in touch at publicity@sandhurstjoggers.org.uk.